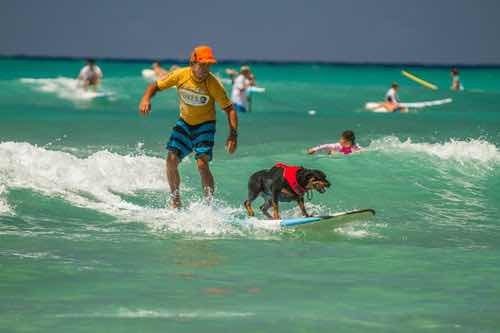 Waikiki Surf Lessons for everyone. At Big Wave Dave, we encourage all ages and skill levels to come out and enjoy the ocean. Whether you are a seasoned surfer looking for local knowledge about the best breaks or a brand new surfer ready to catch your first wave, our instructors are ready to get you outfitted and in the water. Our goal is to spread aloha. A fun experience in Waikiki. Have the best surf lesson of your life! Big Wave Dave Surf School wants you to have the best experience in your life! Have fun, learn about the ocean, Hawaiian culture and most importantly learn how to surf in Waikiki. Let us turn your surfing dream into a reality. The feeling of a ride lasts a lifetime and is one of the top ten things to do on during your Hawaiian vacation. Whether you are a seasoned surfer looking for local knowledge about the Hawaii breaks, or a brand new surfer ready to catch your first wave, Big Wave Dave can help you with all the things you need to get out there. Big Wave Dave Surf Co. offers surf lessons for beginner, intermediate and advanced students. All surf lessons will take your surfing to the next level. In addition, we offer Outrigger Canoe Rides and Stand Up Paddle Board lessons. A history of surfing in Waikiki. Get to know the famous wave. Surfing, originally known as wave-sliding or he’e nalu is the ancient sport of Hawaiian royalty. Big Wave Dave Surf Co. is here to provide you with the best surf instruction available. We offer group surf lessons or private surf lessons, meant to suit your schedule and budget. You are guaranteed to catch a wave on your first lesson. All instructors, in addition to Dave, will have a minimum of 10 years experience in surfing instruction on the water and hold a certificate with the American Red Cross in Life guarding, First Aid, CPR and Open Water Rescue, along with the Hawaii DLNR surf instructor certification. Come and join us for a day of surfing that will be a life-changing experience.